The "Me" Book: The Next Adventure: Detours! Hi everyone! It seems like forever since I posted on this blog. The truth is I took a detour which took me on a new adventure. Just like I talked about in a previous blog. As you know I am an artist (you can see my work on my website at www.goldenisis.com.au). For many months I had been toying with the idea of creating a set of oracle cards using my mandalas and after waking from a dream one night realised that the time was right. I enlisted the help of a friend Vikstar (http://medzenforyourmojo.com/) to channel the readings for me, and a new adventure began. The set consists of four sets - Archangels, Ascended Masters, Names of God and Chakras. They are designed to give help and encouragement to lightworkers and those travelling with the light! Our oracle cards will be available in stores next year, published by Blue Angel Publishing! So exciting. Dreams really can come true! Meanwhile, prints of the mandalas are available on www.goldenisis.com.au Come and check them out! Back on deck now, so keep a look out for my next blog! I am an artist, intuitive healer, Past life regressionist, author and Reiki/ Seichim Master/Teacher. Owner and principal, of Golden Isis - Inspired Energy, but most of all I'm a traveller. Travelling on a path of self-discovery, learning along the way what makes me ME! Discovering why I'm here and helping others along the way to do the same. Since 2003 I have taught "Me" Classes inspiring others to find their own path by discovering their past, present and future. 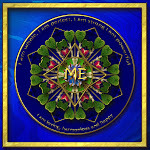 This year, 2011 I was inspired to put these classes together in a book - The "Me" Book: A Journey of Self-Discovery. I now continue my journey taking new paths and exploring some that I have already visited briefly. My aim? To share the meaning of life.